The ambitious $1.1 billion project has been in the works for more than a decade and aims to provide much-needed water to Jordan, Israel and the Palestinian territories. Jordan's water and irrigation ministry in a statement Monday said the consortiums were made up of 20 engineering firms from Asia, Europe and North America. 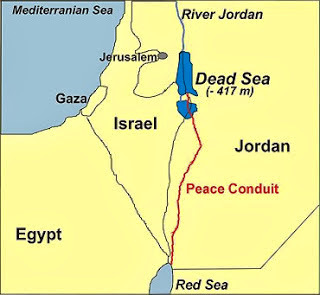 The first phase of the project involves building a conveyance system to transfer 300 million cubic meters (10.6 billion cubic feet) of water each year from the Red Sea to the Dead Sea. The ministry has said it would also see the construction of a desalination plant with a capacity of 65-85 million cubic meters a year.